The Entlebucher Sennenhund or Entlebucher Mountain Dog is a medium-sized herding dog, it is the smallest of the four regional breeds that constitute the Sennenhund dog type. The name Sennenhund refers to people called Senn, herders in the Swiss Alps. Entlebuch is a region in the canton of Lucerne in Switzerland. The breed is also known in English as the Entelbuch Mountain Dog, Entelbucher Cattle Dog, and similar combinations. Entlebucher puppy at eleven months of age. One writer believes that all of the Sennenhund breeds are descended from large molossers brought to Switzerland by the Romans in the first century B.C. However, the Entlebucher was only described as a separate breed in 1889, although for many years little distinction was made between the Appenzeller Sennenhund and the Entlebucher Sennenhund. In 1913, four bobtail Entlebucher Sennenhund were shown to Albert Heim, an advocate for the increasingly rare Sennenhund breeds. The breed was entered into the Swiss Kennel Club stud book, but World War I intervened, and at first after the war no examples of the breed could be found. The first breed club was not formed until 1926, sixteen dogs of the type were found in 1927, and the breed slowly was restored. Although originally kept for guarding and herding, today the breed is usually kept as a lively companion. It shares many characteristics of other Mountain dogs from around the world. The female Entlebucher Sennenhund is a square; the male is a longer, less square, sturdy, medium-sized dog. It has small, triangular ears and rather small brown eyes. The head is well proportioned to the body, with a strong flat skull. The long jaw is well formed and powerful. The feet are compact, supporting its muscular body. The smooth coat is close and smooth with symmetrical markings of black, tan, and white. This tricolor coat has white on its toes, tail-tip, and the chest and blaze where the fur is soft and fluffy; the tan always lies between the black and the white. It has muscular, broad hips. The hocks are naturally well angled. The tail is sometimes docked, a practice which is now prohibited by law in many countries, or it may have a natural bobtail. Height at the withers is 19-20 ins (48–50 cm) and weight is 45-65 lbs (20–30 kg). As with all large, active working dogs, this breed should be well socialized early in life with other dogs and people, and be provided with regular activity and training. Temperament of individual dogs may vary. The Standard says that the breed is "good-natured and devoted towards people familiar to him, slightly suspicious of strangers." The Entlebucher Sennenhund is recognised internationally by the Fédération Cynologique Internationale, using the standard written in the breed's native Switzerland. Other national kennel clubs not affiliated with the Fédération Cynologique Internationale also recognise the breed, often writing their own versions of the breed standard. The Entlebucher is recognised by The Kennel Club (UK) and the Canadian Kennel Club and placed in the Working Group. The United States Kennel Club (US) places the breed in the Guardian Dog Group. It is not yet recognised by the New Zealand Kennel Club or the Australian National Kennel Council. The breed is recognised by numerous small clubs and internet-based registries, where it is promoted as a rare breed for puppy buyers seeking a unique pet. The breed was accepted into the American Kennel Club Stud Book on December 1, 2010 and became eligible to compete in the herding dog group on January 1, 2011. Inbreeding due to the small foundation stock numbers has led to Entlebuchers suffering from congenital defects, the most common of which is hip dysplasia. Hemolytic anemia also is known to occur. Progressive Retinal Atrophy (PRA) is also present in the breed. The National Entlebucher Mountain Dog Association (NEMDA), in collaboration with other organizations, is working to eliminate these issues from the breed through responsible breeding, genetic testing, and fact dissemination. ^ a b c Clark, Anne Rogers; Andrew H. Brace (1995). The International Encyclopedia of Dogs. Howell Book House. p. 214. ISBN 0-87605-624-9. ^ "Entlebuch Cattle Dog". Naturhistoriches Museum der Burgergemeinde Bern. Archived from the original on July 7, 2011. Retrieved April 4, 2011. ^ "Entlebuch Cattle Dog (Entlebucher Sennenhund)". June 28, 2002. Archived from the original on June 6, 2011. Retrieved April 4, 2011. 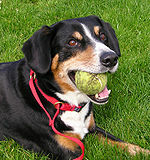 ^ AKC Entlebucher Mountain Dog News, Retrieved April 9, 2011. ^ "Three New Breed Recognized by AKC]". The Globe and Mail. January 26, 2011. Retrieved January 26, 2011. 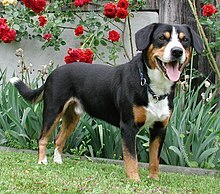 Wikimedia Commons has media related to Entlebucher Sennenhund.